On March 21st, our class celebrated World Down Syndrome Day. World Down Syndrome Day is designed to recognize and celebrate the contributions of people with Down Syndrome. It is also a day to highlight the rights, inclusion and well being of those with Down Syndrome. 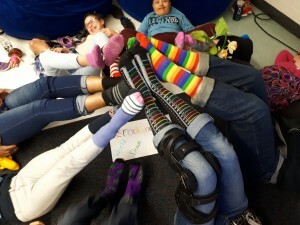 It is common for many schools and places around the world to demonstrate their acknowledgement of the day by wearing unusual or mismatched socks. This simple act encourages all of us to celebrate uniqueness and diversity. For us, preparing to wear our special socks was a great way to start the conversation about this fantastic day.We sang the song “Lots of Socks” every morning throughout the month of March and spoke daily about Down Syndrome. On the 21st of March, we had a celebration in the morning where we all shared what was special about each of us. We spoke about Down Syndrome and all the amazing people in the world with Down Syndrome. And of course, we showed off our socks! In addition to our class celebration, I thought I would share some of the things that I have learned this year. I am very fortunate that I teach 5 students with Down Syndrome. It has been my first-time teaching students with Down Syndrome so I had a lot of misconceptions going into the role and I have learned a lot! The first thing I learned fairly early in the year was the correct way to speak about someone with Down Syndrome. In the past, I had the misconception that a person with Down Syndrome may be referred to as someone with Down’s. That plural form is incorrect. John Langdon Down was the person who classified the Syndrome but he did not have it and therefore, it is not possessive. The only proper way to speak about someone is to put the person first (as you would with any exceptionality) and follow it with either Down Syndrome or D.S. Eg. Student with Down Syndrome or Student with D.S. I also had the misconception that people with Down Syndrome are always happy. I can confirm for all of you with out a doubt that my students demonstrate a variety of emotions regularly. My 3 students who have just hit puberty, go through about 25 emotions an hour as many of you have experienced with your students who are adolescences. Whew! However, my students do smile a lot and that sometimes prompts many of the adults at my school to speak about how “sweet” or “cute” my students are. Sometimes I have to gently remind the staff that my students are not young children and that they need to be spoken about the same way you would speak about other 11 and 12-year-old students. They need high expectations for behaviour and communication. Finally, as I started reading articles about people in the Down Syndrome Community, I was surprised how many times they were referred to as being afflicted with Down Syndrome. Just this week I read an article that spoke about people being victims of Down Syndrome. I assure you that my students are not victims. They are some of the coolest, most interesting, charismatic, smart, caring students I have ever taught.